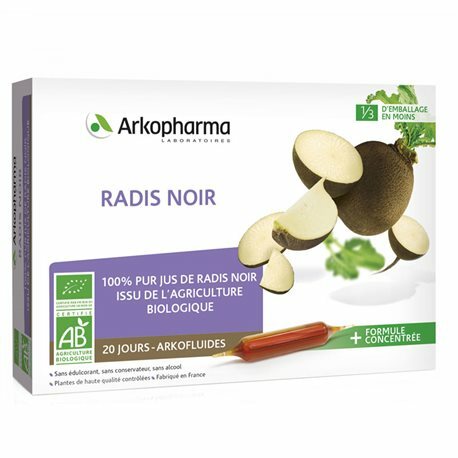 Bulbs Arkofluide DEPURATIVE TRACT BIO LABORATORIES Arkopharma are food supplements made from black radish, intended to regain digestive comfort by drainage and cleansing the liver. The black radish is a vegetable that belongs to the cruciferous family and originated in Asia, it can be consumed with the image of a turnip. This vegetable is rich in vitamin C and allows it to operate on natural defenses, as well as vitamin B, sulfur, water and fiber, which makes it a very interesting agent on intestinal comfort, as it is on the proper functioning of transit and promotes the elimination of waste and toxins, preventing the formation of intestinal gas and bloating, it is also a natural antibacterial on the digestive flora. The black radish is a drainer which acts on the gallbladder and liver to balance and optimize their functions. This plant will allow to drain the gallbladder and liver to restore a balanced and regular operation, it heals and improves liver and biliary disorders. Its high fiber content helps in the proper functioning of the digestive process and acts on the phenomenon of constipation. Bulbs Arkofluide DEPURATIVE TRACT BIO LABORATORIES Arkopharma, will restore normal function and regulate bowel movements by acting on the drainage of the liver and gallbladder. You can find a belly full health, which works normally again. Shake vigorously before breaking the bulb tips. Pour the contents of the bulb in half a glass of water and mix. Are dietary supplements and should not replace a varied and balanced diet coupled with a healthy lifestyle. Herbal tea is not the only liquid form through which herbal treatments are administered. Ampoules containing a solution extracted from plants are also increasingly used on the market. Find a wide selection of medicinal plants in liquid form: SIPF (Integral Suspensions of Fresh Plants), glycerinated and alcoholic extracts, ampoules (Arkofluide) and tailor-made solutions from pharmaceutical laboratories.